Trellis lets me live out my dreams of having a garden of flowering vines without all the fuss and dirt. 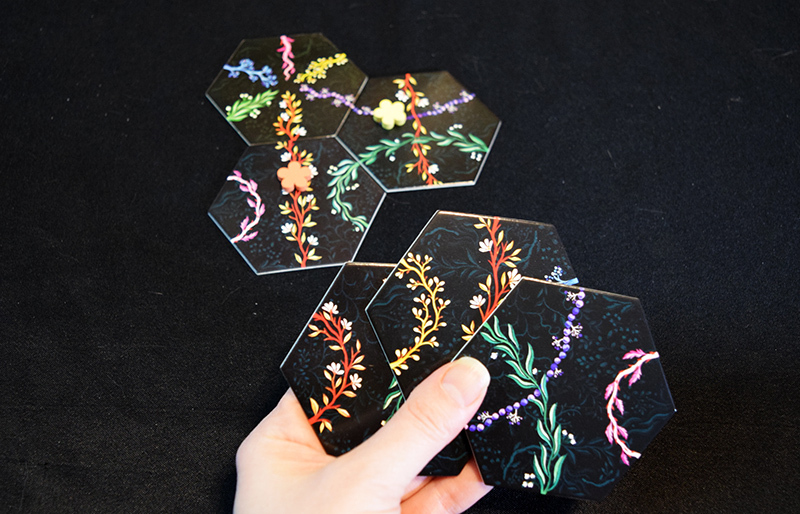 As tile-laying games go, Trellis is fairly simple to learn, but there’s definitely some strategy behind the gameplay. I have a small balcony off my apartment that gets just enough sun that I delude myself into believing I can grow a lush garden. Every year I try, and every year I fail to take into account my lack of a green thumb. Thus the only plants I really manage to grow are in board games. Andrew: Hey, you grew some great jalapenos once. Jess: And how many pots of tomatoes had to die for those jalapenos to flourish? 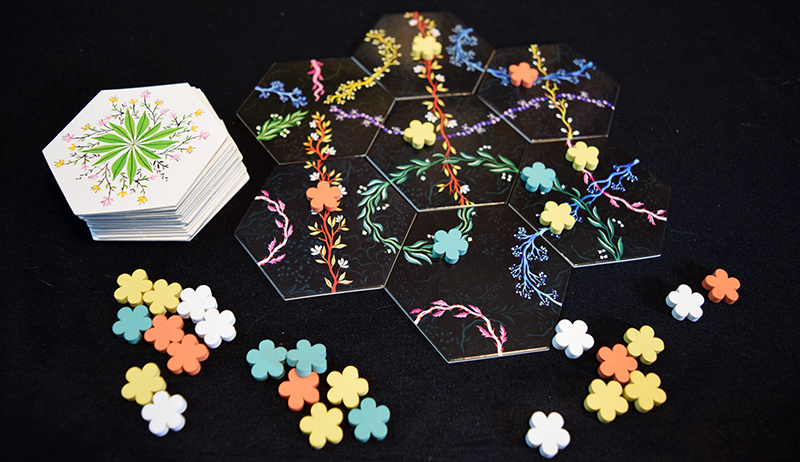 The goal of Trellis is to be the first player to place all of your 15 flower meeples (I shall call them fleeples). 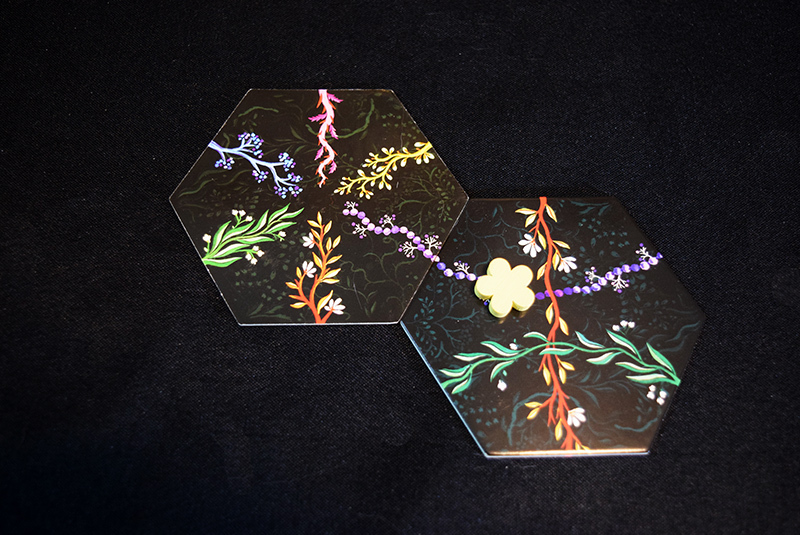 Players start the game with a hand of 3 hex tiles, and on your turn you will plant a tile, claim a vine, claim gifts, and draw back up to 3 tiles. Planting a tile is pretty easy – all you’ve got to do is select one of your tiles and ad it to the board. The tile has to connect to at least one existing vine. Then, if one of the vines on the tile you’ve just placed hasn’t been claimed, you can claim it by adding one of your fleeples to it. Claiming a vine means that it’s yours, and no other player can claim it. When a previously-claimed vine gets added to (whether they belong to the active player or not), that vine’s owner can add another one of their fleeples to the newly-added tile. When that lets you add your own fleeples, that’s awesome! You’re one step closer to hitting 15 and winning! On the other hand, you might also extend your opponents’ vines. But while that might seem like a bad thing, your generosity will be rewarded by letting you place one bonus fleeple for each flower you helped your opponent place. By strategically growing your opponents’ vines, you can take advantage of this and potentially unload lots of your fleeples at once! As soon as someone places their 15th flower, they win. 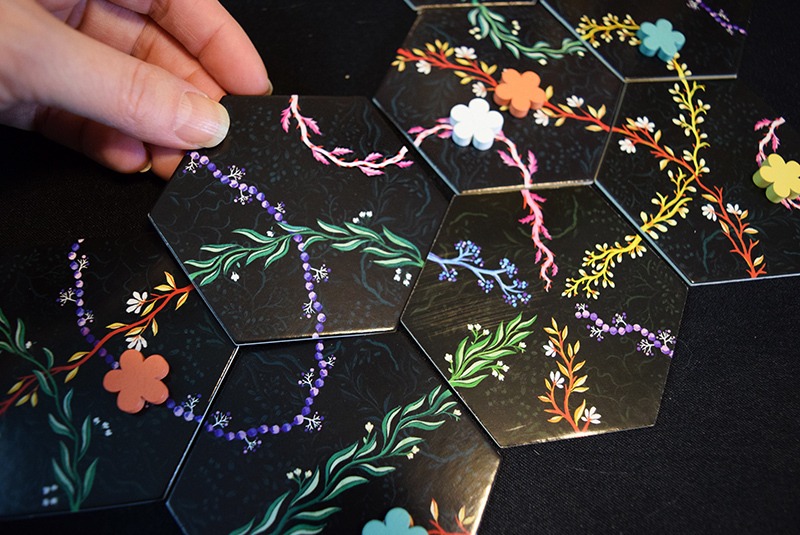 Jess: As with many games I am drawn to, Trellis has some fantastic art. The first time I spotted it at a convention I was keen to try it. The gameplay is surprisingly thinky. You not only have to consider what placements will benefit you , but also how much you want to benefit your opponents. Sure you get a bonus by helping others, but if you’re not careful you might just secure them the win. Andrew: I liked Trellis just fine. It’s really pretty on the table and the gameplay is simple to engage. My only complaint was that at 2 players, the possibility of interaction goes way down, so a big part of the strategy sort of dries up. But that said, as pretty fillers go, I can get behind this one. 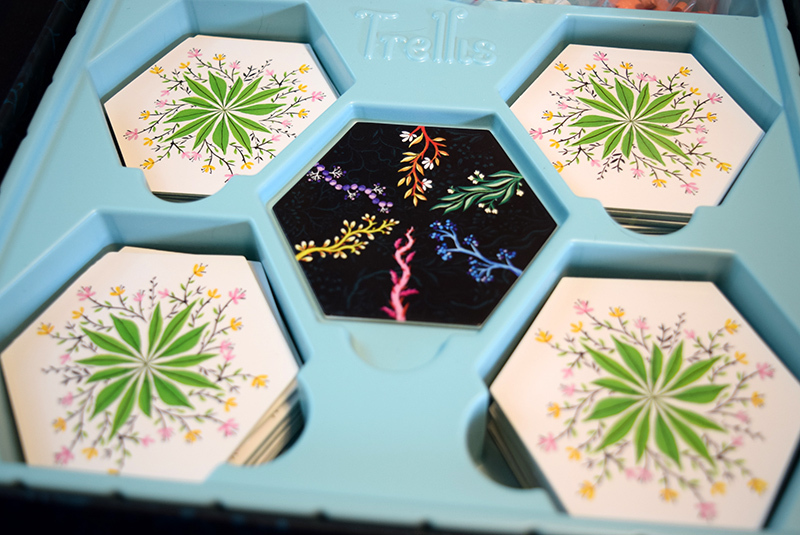 If you are looking for a lighter area control/strategy game that’s beautiful and great for a casual evening with friends, make sure to check out Trellis. Jess: Come to think of it, you really hate tomatoes don’t you? Andrew: Yes. They are horrifying balls of goo. Jess: …You wouldn’t sabotage my garden… would you?